The SpiderForest Webcomic Collective was founded in 2004 to be a home and collaborative community for quality, creator-owned webcomics of all genres. Last year, with the help of Kickstarter, we printed our first collective anthology. 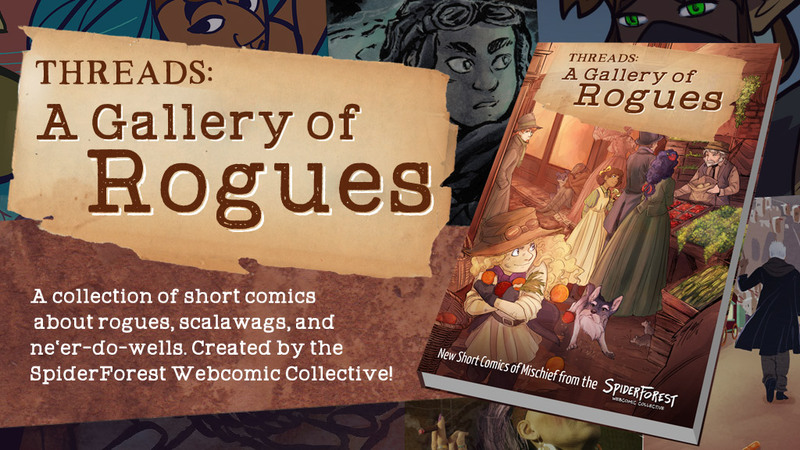 This year we’re at it again with a collection of 16 brand new standalone short comics! For this volume, we challenged our members to tell us about their favorite rogues, and they’ve obliged with everything from elvish thieves to space pirates, outlaw mages to cyberpunk con men, demon pickpockets to trickster snakes. This 142-page collaboration was funded through the generous contributions of our members, readers and Kickstarter backers, and will be available for the first time at SPX 2018!